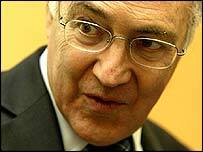 The EU should not try to become a rival to the United States, Tory leader Michael Howard has warned. He said he was increasingly worried about the apparent ambition in some quarters to make the EU an alternative superpower to America. In a speech in London, Mr Howard warned against "serious tensions" that had emerged in the wake of the Iraq war. "Even before the Iraq war I was becoming increasingly concerned about a growing rift," he said. "One of my worries is that for some people the main motive for greater political union in Europe is to establish a rival to the United States. I don't want rivalry. I want partnership." And he accused Prime Minister Tony Blair of failing to ensure Britain had enough influence over decision-making on the ground in Iraq. Mr Howard went on to disagree with claims by French President Jacques Chirac, due to hold talks with Mr Blair on Thursday, that the world was more dangerous in the wake of the invasion of Iraq. He said the world was a better place with Saddam Hussein removed from power. Mr Howard described George Bush - recently re-elected for a second term as US president - as "strong". And he urged the Republican leader to send a "senior and powerful" figure to ensure that a settlement in the Middle East was reached. Peace ultimately came down to Israel and the Palestinians but the US and Europe had a role to play, he added.